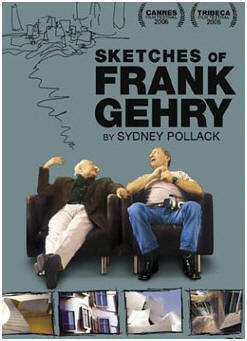 January 3, 2010 (CARY, NC) – The second annual Nowell’s Architecture Movie Series, featuring hard-to-find films about Modernist architects and architecture, continues with a special screening of “Sketches of Frank Gehry” directed by Sydney Pollack on Thursday, January 13, 7 p.m. at the Galaxy Cinema in Cary. Presented by the nonprofit historic preservation group Triangle Modernist Houses, “Sketches of Frank Gehry” was Pollack’s first feature-length documentary. Through film, digital video, and deliberate informality, he explores the life, work, and work process of his long-time friend, the brilliant and sometimes controversial Los Angeles architect dubbed “the most important architect of our age” by Vanity Fair. A Pritzker Prize winner, Frank Gehry has created some of the most iconic buildings of the modern era, including the Guggenheim Museum Bilbao, the Walt Disney Concert Hall in LA, and his own house in Santa Monica. Completed in 1978, Gehry’s house is comprised of an existing Cape Cod house that he surrounded and cut through with a metal and glass addition shot through with implied volumes created by skewed pieces of chain link, wood studs, and glass. Despite his dramatic structures, Gehry is known as a shy and illusive artist. Pollack brings viewers into his world not only through his seemingly informal film style but also through his friendship with Gehry. Tickets to “Sketches of Frank Gehry” are $7.95 in advance or $9 at the door. To see a trailer of the film, the list of upcoming movies in the series, and to purchase advance tickets, go to www.trianglemodernisthouses.com/register.htm. Sponsors for this special screening include Nowell’s Contemporary Furniture, Tonic Design+Construction, Kontech Systems, Foundation bar and lounge, and Center Studio Architecture. Galaxy Cinema is located at 770 Cary Towne Boulevard. For more information visit www.mygalaxycinema.com.